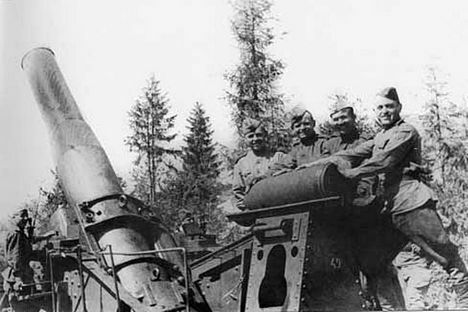 The 305 mm howitzer was the descendant of the giant cannon on display in the Moscow Kremlin. Unlike its predecessor, it saw plenty of action on the battlefield. First used in WWI, it was then a key strategic weapon in the Red Army’s advance on the capital of the Third Reich in WWII. The giant Tsar Cannon on display in the Moscow Kremlin has long been a symbol of the Russian capital. Whenever tour guides tell visitors about its history, they note that it never fired a shot. However, few people know that the legendary cannon was the prototype of an outstanding generation of weapons that not only saw combat service but also secured their place as the mightiest examples of their time. The idea of creating a high-powered land weapon was first floated in military circles in 1915 at the height of the First World War, when the Russian Army suffered a succession of defeats against German forces. These battlefield failures were mainly due to serious gaps in Russia’s artillery arsenals and in heavy artillery in particular, while the Germans were able to use their state-of-the-art guns to smash one Russian division after another. The Russian Army urgently needed firepower capable of inflicting equal losses on the enemy. The most powerful weapons were traditionally used by the Russian Navy, since ships provided a convenient gunnery platform for heavy artillery. By the summer of 1915, eight 305 mm howitzers had been produced for the navy. But because of the dire situation at the front it was decided that four of these would go to army field forces. The 64-ton monsters could be moved between locations on railway transporters without an adverse effect on their efficiency. Their devastating power was demonstrated in the first tests, in which incendiary shells weighing almost 400 kg proved capable of punching through any reinforced concrete fortification. Furthermore, firing a 305 mm gun built up such a pressure of gases that an entire salvo created a vacuum over a radius of several meters, sucking in loose items as if into a whirlpool. The 305 mm weapons arrived at the front in the summer of 1916 and fired their first rounds in anger on June 19. One direct hit on a German bunker literally threw it meters into the air in a column of soil and debris. That winter a division of the guns also went into action near Riga, transforming the German firing positions and machine-gun nests into gaping craters with a few good hits. The Russian infantry met no resistance while taking control of enemy positions that had been built over the course of 18 months. The 1917 Revolution and the sudden end of the First World War for Russia rendered these heavy weapons redundant. However, the 30 guns retained by the Red Army provided the basis of design for the Soviet 305 mm guns that were later installed at forts and defensive navy bases. Their might was brought to bear on Hitler’s forces in September 1941, when barrages from eight 305 mm guns halted the German attack at Sevastopol. Firing from a range of 44 kilometers, the battery was impervious to any return fire. The guns were similarly used to defend positions around Leningrad, which never fell to the German forces. The old Tsar Cannons were grouped into five divisions with special firepower and dispatched to the front in 1944. Their hour of glory came during the Soviet offensive into Karelia, Belarus and Poland, where the enemy defenses were concentrated in a series of reinforced lines and fortress cities. One gun division brought up in support of tank and naval forces sufficed to breach the Finnish fortified zone along the Mannerheim Line, which the Soviet Army had assaulted with heavy losses for several months in the winter of 1939-40. The might of the Russian 305 mm guns was also felt by concrete-clad German positions on the River Oder which the Nazi command had calculated would be enough to check the Soviet advance. In April 1945 the heavy guns also supported the storming of Berlin. The high point for the Tsar Cannons, though, came during the operation to capture the Third Reich’s giant fort at Königsberg (modern-day Kaliningrad), when three divisions of the heavy artillery inflicted more than 200 direct hits on the redoubt. While only 15 per cent of the shells penetrated the concrete casing of the emplacements, it was enough to break the German defenses. Having been produced to such high assembly standards, the old guns continued to serve in the Soviet artillery long after the Second World War. The last units were decommissioned only in the late 1950s, and one of these is now on display at St. Petersburg’s Artillery Museum.